My love for Middle Eastern food still hasn't left me. I can't tell you what it is but I am just so into the way every flavour possible is combined in the most harmonious ways. We are talking savoury, sour, sweet and bitter all in one dish mixed with so many different aromatic spices and ingredients. It's like a mini festival for the taste buds. Remember when I made this? 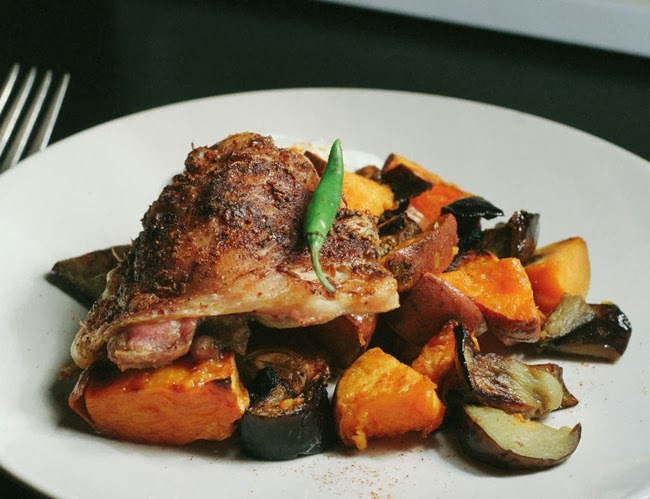 We had plenty of dry chermoula spice left over sitting in our spice cupboard and I thought chermoula chicken baby. You've probably gathered by now that I am a big fan of roasting veg and meat. It's easy, it's a one pot or tray business and the taste is unbeatable. Also if you are on a diet, having an array of homemade spice mixes in your cupboard is a great way of making a usually bland meal taste amazing while still being super healthy. 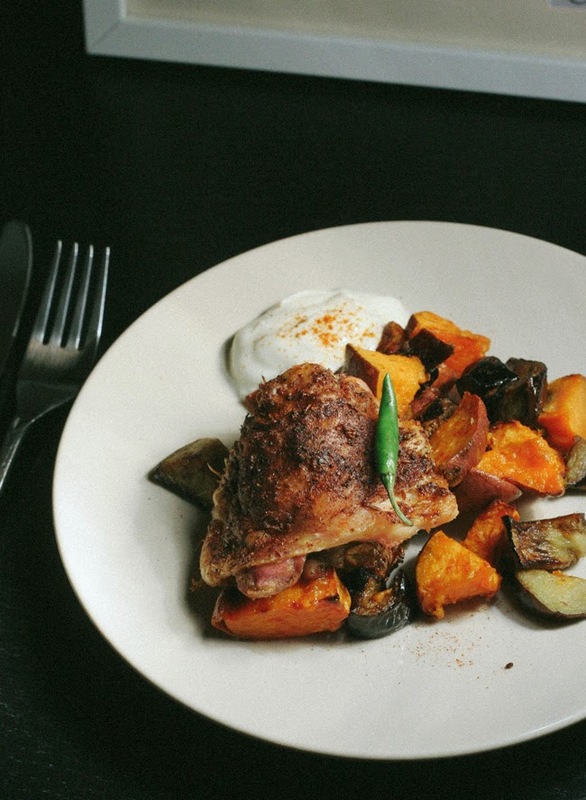 This is very yummy with a little Greek yoghurt on the side and the spicy chicken contrasts the sweet vegetables beautifully. Pre-heat the oven to 190˚C. Prick the chillies and push one under the skin of each chicken leg. Place the legs into a large bowl, drizzle with a little olive oil, season with salt and pepper and sprinkle the chermoula spice mix over the top. Using your hands rub everything into the chicken until it's well coated. Place onto a baking tray. Put all the veg into a good size baking tray, drizzle with some olive oil and season with plenty of salt and pepper. Place the chicken on the top shelf of your oven and the veg two shelves below. Cook for 45 minutes to 1 hour, tossing the vegetables half way through. You want them to be charred around the edges and gooey in the middle. 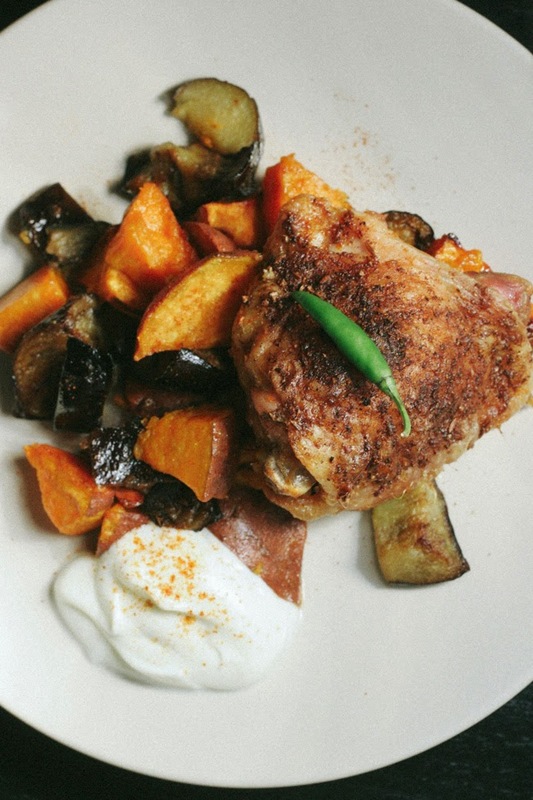 Serve the chicken on top of the roast vegetables and a dollop of greek yoghurt on the side.